The Tibetan Terrier is a medium sized, shaggy, square dog, measuring 14-17 inches from shoulder to ground, and weighs 18 to 30 pounds. An average sized dog is 15-16 inches in height and weighs 20 to 24 pounds. Surprisingly agile, the Tibetan Terrier is powerful and surefooted in movement, as capable of surviving in rough terrain here as he was in his Tibetan homeland. The breed has a double coat. The inner coat is fine, similar to cashmere. The outer coat may be almost straight or undulating. It is neither silky nor curly. 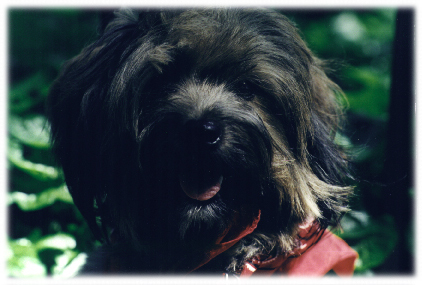 Tibetan Terriers should have a heavy fall of hair over the eyes and face to protect them from the elements. The breed should also have a lovely plumed tail, set on the body rather high and carried over the back. In addition to the breed's square, compact look, other important characteristics include large, almost flat feet suitable for traction on rough ground, a good sized rib spring and superb balance. 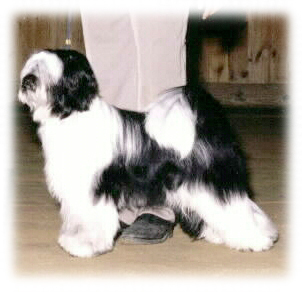 All this is accompanied by strong reach of the front legs and strong drive in the rear.The Tibetan Terrier received AKC (American Kennel Club) recognition in 1973.